As the water diversion project is in full swing in Xiongan, North China's Hebei province, Li Qingshan, who is responsible for the project, makes no secret of his pride. The project, taking water from China's Yellow River to Baiyangdian Lake, the largest in the province, is one of the first to be carried out since the central authorities announced the establishment of Xiongan New Area in April 2017. "By the end of February, the lake will receive 35 million cubic meters of water," Li, a senior manager at China Xiongan Group Ecological Construction Co, said, adding that the work was kicked off on Feb 1 after seven pump systems had been installed. Li and his team will start in March to complete the construction of a whole station, including a pump house. The project is one of the measures for the ecological restoration of Baiyangdian Lake in Xiongan, the largest wetland ecosystem in northern China. The water level of the lake will stand at 6.5 to 7 meters deep and its coverage will be restored to 360 square kilometers by 2035, according to a plan for Baiyangdian's ecological environment treatment and protection (2018-35), quoted by China National Radio. The plan is in line with the speech made by President Xi Jinping, during his first visit to Xiongan on Feb 23, 2017. He stressed that the lake should be well restored and protected as the development proceeds. Now, two years later, the new area has shifted its focus from preliminary plan to construction. About 100 kilometers southwest of Beijing, Xiongan New Area is scheduled to expand to 1,770 square kilometers by 2035, according to People's Daily. As an integral part of the integrated development of the Beijing-Tianjin-Hebei region, Beijing's noncapital functions will be transferred to Xiongan. Since its establishment, the authorities have taken the time to make a series of plans for the development of Xiongan, which is designated to have a lasting significance for many years to come. According to Lin Nianxiu, vice-minister of the National Development and Reform Commission, the blueprint for Xiongan, including development plans and supporting policies, has been completed over the past two years. In December, the central authorities approved an overall plan for Xiongan New Area (2018-35). 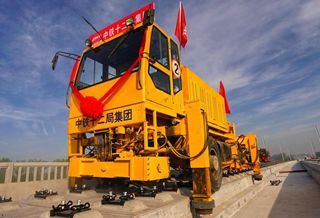 "This is the first year that plans for Xiongan will be implemented and the construction of key projects will be pushed ahead," said Wang Dongfeng, Hebei's Party secretary. China Xiongan Group, a State-owned company established in 2017 for Xiongan's development, has made about 30 bidding announcements on its website for carrying out projects since September. The projects include the construction of greenbelts, waste treatment facilities, rail transit stations, urban roads, pipe network systems, and a complex of offices and hotels. By 2022, the construction of infrastructure will be basically completed and the appearance of an urban area will be initially formed, Xinhua News Agency quoted the overall plan for Xiongan as saying. Preliminary results will also be achieved by then to transfer Beijing's noncapital functions, including universities, research institutes, medical institutions, corporate headquarters, financial institutions, and public institutions. According to Chen Gang, Party secretary of Xiongan, the new area will control the use of land by developing up to 30 percent of its area in the long term, leaving the rest as green space and water areas. "Xiongan will be a city with intermediate density where people can have good contact with nature," Yang Baojun, president of China Academy of Urban Planning and Design, was quoted as saying by China National Radio.